As his father ‎K Chandrashekar Rao eyes the Prime Ministerial seat and is set to take the mantle at the Centre, the present Cabinet Minister for Information Technology and Panchayat Raj of Telangana KT Rama Rao is gearing up to be his father’s successor in Telangana. As one among the few young and dynamic leaders in Indian politics, his role both as the workign president of Telangana Rashtra Samiti and IT Minister has received much appreciation from people across the country. As the IT minister of the state, his role in turning Telangana into an investor and tech-friendly state is quite well-known. Be it at Davos or Telangana, KTR sure does know how to make the right investor pitch thus, inviting tech-giants to establish their CoEs and work with the government. In this article, we look at the number of time KTR has pitched for artificial intelligence. Coaxing adobe to set up a CoE in Hyderabad: Upon KTR’s strenuous effort to bring the Adobe’s facility to Hyderabad since 2015, last year the company announced that it will set up their CoE in Hyderabad very soon. The announcement was made at the sidelines of the World Congress on Information Technology, post the meeting between Adobe CEO Shantanu Narayen and KTR. “Excited to announce Adobe is starting an advanced AI lab in Hyderabad. A global leader providing content creation & enterprise experience software solutions entering Hyderabad is a great asset for the local ecosystem. Thanks a ton to Adobe Chairman & dear friend Shantanu Narayan,” KTR tweeted following the announcement. Pitches for open data policy: In an attempt to make government data more available to people and make services more accessible to the public, under the leadership of KTR, the government introduced Open Data Policy, making it the second and the second state in the country to do so. The move is seen as an attempt to ensure transparency at the government’s end and address public issues with the help of online information. “It can help us save expenditure and also innovate. The open data policy was developed along with others under the overarching IT policy,” KTR had said about the development. 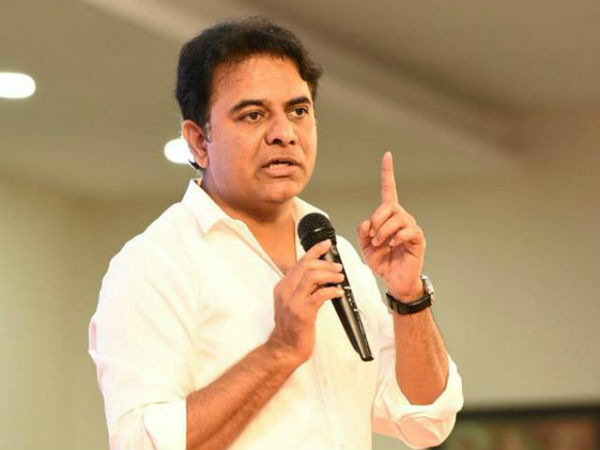 On addressing local issues with AI: While speaking at the sidelines of the World Economic Forum in Davos last year, KTR spoke in great length about the government’s Open Data Policy and how it is strengthening his government. At a speaking session titled ‘Global Tech and Local Solutions: Artificial Intelligence’ at Davos, he highlighted how the Telangana government created 50 different data sets for the public so that AI-based solutions could be applied on the data to find solutions to various problems. “The State plans to identify ‘Problem Statements’ and run hackathons based on the data collected once a critical mass of datasets reaches the platform,” he said. To turn Telangana into a global hub for AI and data science: In order to usher in technology to the state and encourage more players to take up technology, the TRS government brought out its IT Policy and T-Hub for encouraging startups. “Government of Telangana realises the opportunities the newer technologies present and laid the foundation of a Data Analytics Park to tap the innovation and employment opportunities in this rising sector. The Government is keen to create a robust Data Science and Artificial Intelligence ecosystem for the various stakeholders to thrive, by providing support, mentorship, and other capabilities,” KTR said while at the launch of Nasscom’s CoE for AI and data science. For long term collaboration in the field of AI: A go-getter, the minister held talks with Japanese and South Korean representative to procure investment from the countries for the Phase 2 of Hyderabad Metro Rail last year. An MoU was signed state and South Korea for long term collaboration in the field of gaming, AI and electronic manufacturing.